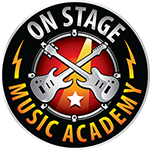 We tailor our music lessons for kids and teens specifically for each student based on what they want to achieve. Every lesson includes song work, where we learn the songs and styles that have inspired you to pick up the instrument in the first place! The ultimate goal is a rich, life-long understanding of music. When you’re ready to go beyond private lessons we will place you as part of a band. With an experienced instructor coaching the whole process, you’ll learn how to collaborate with other like-minded musicians and discover what it takes to play in a band. We’ll match you with students of similar age, skill level, and musical taste so that you’re comfortable and ready to take on the challenge. There truly is no greater feeling than successfully playing a set with a band. Much like Band Lab, you’ll be matched with like-minded students who are prepared to take on the challenge. In the guided band performance we’ll be focused live performance experience and preparation. You’ll be coached all the way from the set-list determination to passionate musical phrases, riffs, and solos. Bands perform during our seasonal showcases at local venues and beyond! If performing on stage isn’t quite your calling, that’s okay! We focus our music lessons for kids and teens on what each individual student desires to achieve, whether it be stadium rocking or bedroom jamming!